Hi everyone, Mou here with a tutorial for creating a snazzy paper frame using the Mandala Art set from Faber-Castell Design Memory Craft! Trim cardstock to 8.5 x 5.5 inches. You can also choose your favorite size. You'll need three pieces. Start by tracing the outlines of the mini mandala stencil from the set using the S tip pens, altering the colors as shown. You'll need twelve of the mandalas for the given dimensions. Fill colors in the traced mandalas with the B tip pens as shown. If you have 1" circle punch or dies, you can place them framing the colored mandalas and punch or diecut them. You can also cut around the mandalas with scissors. Attach the mandalas along the outer edges of the second piece of cardstock on all four sides. With ruler and pencil, mark an opening in the page. Placing the page on a self healing craft mat, carefully cut the opening with craft knife. Use a ruler to draw lines along the edges with Black XS tip PITT pen from the Essential set. You can place a photo behind the frame. I decided to add a quote hand-lettered with the Black B tip PITT pen on the third piece of cardstock. Use the frame to jazz up a scrapbook layout or a card. Or give it as a gift. I hope you enjoyed the tutorial and will try this lovely Mandala Art set! Hi everyone, Mou here with a tutorial for a quick piece of art using Watercolor for Beginners Kit! To create this, I used the Watercolor for Beginners Kit, Collapsible water cup and some watercolor paper. You can also use the papers included in the kit. Plan a composition for your piece. Lay the floral and leaf and vine stencils to trace the shapes with the PITT pen. Dip the paint brush in water and pick up some pigment from the little cake watercolor tray. Apply it to the same elements on the entire piece. For color variation or if you are not too comfortable with using paint brushes especially in the smaller areas, you can also use the watercolor pencils from the kit. Create variations in the foliage using blues, greens and yellows. Start coloring the flowers using orange first or choose any other color, but work with one color at a time. Continue coloring the flowers with pink and red. You don't have to limit yourself to solid colors. Feel free to experiment with shading and gradations. If any of the details got lost while coloring, go back in with the stencils and PITT pen to add them after the paints dry. I hope you enjoyed this tutorial. Be sure to check out the Watercolor for Beginners Kit which makes it super easy to create elaborate compositions in just a few steps. Hi everyone, Mou here with a tutorial to show you how to create dreamy landscapes in just a few steps using the Gelatos® 15CT: TRANSLUCENTS. Let's start with the list of supplies you'll need. Now let me walk you through the steps. Recently, I traveled to Puerto Rico on family vacation and fell in love with this beautiful island. We drove around the entire stretch of land and enjoyed the peaceful green vistas. Travel always inspires me to create. I came home with a sketchbook full of drawings and paintings (you can see them on my Instagram @mou.saha.studio) and I am still enjoying painting those scenes. To begin painting your dreamy landscape, start with a light pencil sketch of the basic composition. If you look at my basic sketch, you'll see two parts - the heaven and the earth or the sky and the ground. I picked Creme de Menthe for the sky and Persimmon for the meadow. On the Silicone trey, rub patches of each color of Translucent Gelatos. Dilute them with the waterbrush and start creating washes to define the mountains in the distance and the grassland in the front. Remember, the objects in the front will have more details because they are closer to you whereas the distant objects will remain more vague. Add details with the darker colors to the grassland. Finally, add some cattle to the foreground to finish. I hope you enjoyed this tutorial and will try out these Translucent Gelatos to paint dreamy landscapes of your own! Hi everyone, Mou here with a lettering tutorial using the Modern Calligraphy Kit from Faber-Castell Design Memory Craft! I chose a quote that rings true in my heart - Creativity takes courage by one of my most favorite artists of all time, Henri Matisse. Before we begin, let me list the supplies you'll need to follow along. And now, let me walk you through the steps. Use the curve tool from the kit to draw some light pencil lines with the Goldfaber 6B Graphite pencil as shown. These lines will be your baseline for your words. Write your quote with the same pencil. Go over the pencil lines with the B tip PITT pen. It is okay to make corrections at this stage. I changed how I wrote 'courage' in the previous step. Use the curve to add a line under 'courage' to emphasize the word. In a different font, add the author's name using the SB tip PITT pen. Squeeze little drops of the highly pigmented watercolor paints from the tubes in the kit onto a palette. Using the waterbrush, add small patches of color around the quote to finish the piece. 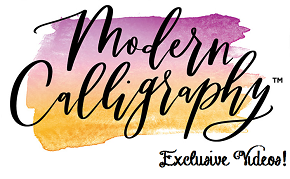 I hope you enjoyed today's tutorial and be sure to try out the Modern Calligraphy Kit. With all the pieces provided including a lined practice pad in the kit, you'll be lettering beautiful quotes yourself in no time!